This year, treat the young scientist in your family to the Omano OM24L stereo microscope. The Omano OM24L stereo microscope is our most popular stereo microscope for home users and this package is well-suited for both hobbyists and young microscopists. Used to examine macro objects that are visible to the naked eye such as insects, crystals and larvae among others, the microscope includes 20x/40x dual power magnification with WF10x eyepieces. It also features both top and bottom, rechargeable LED illumination that lasts all day on one charge. The LED illumination has three adjustable settings. Combined with the included aluminum case, this microscope is highly portable and convenient for use in the field and with no need for messy wires in the home. The microscope head is rotatable through 360 degrees for flexible viewing positions while it can also rotate around the pole in order to view specimens that do not fit on the stage. There are two Wide Field WF10x eyepieces that combine with achromatic, coated 2x/4x objectives for magnification powers of 20x and 40x. Simply twist the objective housing until it stops on either objective. The microscope also includes rubber eyeguards for improved viewing, adjustable interpupillary distance of 55-77mm and a right eyepiece diopter to allow for individual eye focusing.Easy-to-use, affordable and no need for power cords to trip up the young ones, it is a perennial favorite! As with most stereo microscopes, the OM24L includes dual-sided coarse focus controls for convenient left or right hand operation. A diopter on the eyepiece also allows for individual eye focusing. Top and bottom illumination is rechargeable LED with three settings: top, bottom and top and bottom together. The OM24L includes a pole stand with included top and bottom LED illumination. A pole stand lends greater flexibility when viewing larger specimens since the entire head can be rotated off the stage. For example, to inspect a large rock on a table. Summary This year, treat the young scientist in your family to the Omano OM24L stereo microscope. 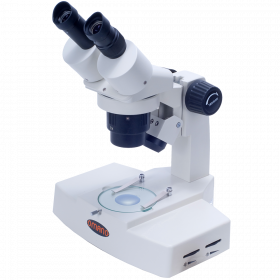 The Omano OM24L stereo microscope is our most popular stereo microscope for home users and this package is well-suited for both hobbyists and young microscopists. Used to examine macro objects that are visible to the naked eye such as insects, crystals and larvae among others, the microscope includes 20x/40x dual power magnification with WF10x eyepieces. It also features both top and bottom, rechargeable LED illumination that lasts all day on one charge. The LED illumination has three adjustable settings. Combined with the included aluminum case, this microscope is highly portable and convenient for use in the field and with no need for messy wires in the home. Optics The microscope head is rotatable through 360 degrees for flexible viewing positions while it can also rotate around the pole in order to view specimens that do not fit on the stage. There are two Wide Field WF10x eyepieces that combine with achromatic, coated 2x/4x objectives for magnification powers of 20x and 40x. Simply twist the objective housing until it stops on either objective. 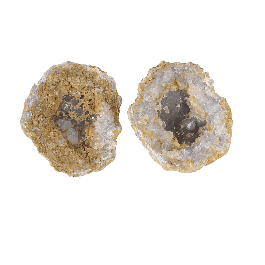 The microscope also includes rubber eyeguards for improved viewing, adjustable interpupillary distance of 55-77mm and a right eyepiece diopter to allow for individual eye focusing.Easy-to-use, affordable and no need for power cords to trip up the young ones, it is a perennial favorite! 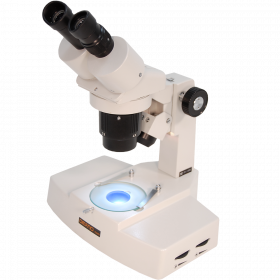 Focus & Illumination As with most stereo microscopes, the OM24L includes dual-sided coarse focus controls for convenient left or right hand operation. A diopter on the eyepiece also allows for individual eye focusing. Top and bottom illumination is rechargeable LED with three settings: top, bottom and top and bottom together. Stand The OM24L includes a pole stand with included top and bottom LED illumination. A pole stand lends greater flexibility when viewing larger specimens since the entire head can be rotated off the stage. 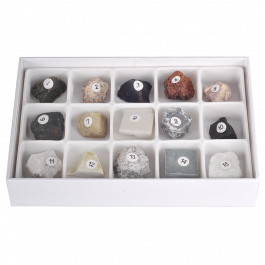 For example, to inspect a large rock on a table. Wt. and dimensions: 12 Lb. 16" x 14" x 10".